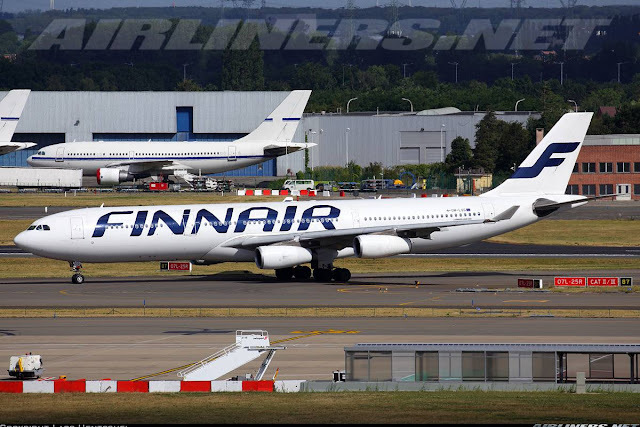 Charles Ryan's Flying Adventure: My first long haul flight for 2014: SIN-HEL with Finnair! My first long haul flight for 2014: SIN-HEL with Finnair! For my return flight trip report. I would like to take this opportunity to give a big thank you to Finnair, Helsinki Airport and Qualityhunters for inviting me over for a couple of days for the #Finnairtweet event and a tour around Helsinki Airport. The experience that I had is extremely valuable as I learned an awful lot from lots of great people at the Finnair's office and the airport. What I also learn about is the human behaviour (the good, bad and the ugly) which has taught me a thing or two, so cheers to all of you! However, I feel that I need to voice out a few concerns about my observation on my flights, I hope the airline representatives who will probably be reading this, take note of them and of course feel free to get back to me if you all have any further enquires. As some of you might know that customer service is one of my most important criteria for my rating. How I give my ratings are based on my flight experience such as the crew's actions and interaction with passengers including myself and the cabin product. Spending a couple of weeks in Korea and Japan has given me what kind of service I hope to get, whether one is flying on Economy or First class, I believe its important to serve the passengers with pride as one's action might affect the decision on whether the passengers would fly with your airline again. With so many competitors out there especially with the "sharks" lurking around such as Emirates, Qatar and Etihad., its important to make it up especially if they are better than your airline in terms of hardware and have a better network than yours. That would be in-flight service! The website is powered by Amadeus which is commonly used by airlines. I had no problem managing my booking to check on the itinerary, doing the online check-in and all that. Website is pretty much basic compared with other airlines, nothing to shout about. Important thing is its working and doesn't give passengers a headache, I think that matters most. Just like some other airlines like British Airways, Qantas (used to fly to Europe from Singapore), you have to pay for your seats and for this case 20 Euros for the basic and seat and a higher price for seats with better legroom such as the emergency rows. For Asians, I think that would come to a shock to us, as normally we don't pay for seats especially on long haul routes. Imaging if SQ, CX, EK or other major Asian carriers follow suit, there would be lots of complaints. So for my flight, looking at the seat map, many seats were taken up already, didn't have much of a choice anyway. Even if there were seats, I would probably not pay for it. The airline allowed you to check-in 36 hours before departure and so I did that, got myself row 55C. It was either that seat or 55A. The flight was at night, 11.35pm departure so it means that I had a full day for myself. I went to work in the afternoon and trust me it was hard to keep my concentration going. Once I got that over with, I went back, pack my luggage and made my way to the airport. Finnair check-in counter opens at around 6pm and I did so before heading to the viewing mall for some quick spotting. Asked the staff counter about the flight and it was indeed full, most of the passengers were Qantas' passengers connecting from Australia. As there wasn't much queue, my boarding procedure was completed within minutes. My boarding pass, was the first to check in for tonight's flight! The inbound flight, arriving Singapore at 1625 and departing at 2335. Quite a number of hours of rest for the aircraft. Very disappointed that an ex-Air France's A340 was going to operate my flight. Hearing so many negative reviews on OH-LQF and OH-LQG, I was dreading this flight. The flight before mine was operated by OH-LQC, that was Finnair's own aircraft and trust me, that is much better than this pair and also OH-LQA which used to operate for Virgin Atlantic. Only one check-in counter was opened. My flight was originally scheduled to be at gate D49, but was changed to D46 which I have used quite frequently! Passengers of my flight, at the holding room at Gate D46. From the gate to boarding the aircraft, everything went smooth. Nothing to mention about. Looking at the crowd, it seems a lot of Australians are heading to Europe for a holiday! Lots of small kids were seen especially later on near the rear of the aircraft. Boarding announcement was made, I waited for my group to be called before making my way down the aerobridge to the aircraft. Once inside, I was underwhelmed by the cabin especially in Y class. It looks very similar to Kuwait Airways especially with the IFE system. My first impression with the crew was a negative one. The crew wasn't very friendly and one of them gave me a stare while I was walking through. It reminded me of the Air India's service I had not too long ago. Got into my seat, an Australian elderly lady thought she was on the aisle seat and I had explained to her that hers was the window seat (55A), she was not happy because she told the agent she wanted the aisle seat, but anyway she settled down and we started chit chatting. The air con in the aircraft didn't seem to be working, it was hot and stuffy! Had to fan myself for a while. It didn't get cool until we were flying! Here are some photos of the cabin. At least the seat cover makes the cabin look very cozy! Still walking to my seat, its one of the last few rows. Now, do you see whether the problem is? I checked out the toilet later during the flight! I feel like in the 90s! Non-Avod first generation PTV, only 7 channels were offered and for my IFE system, I had only 3 channels that were working. The set of crew consisted of majority Finnish crew and a few Singaporean crew. 3 of them were working in the economy class I think. 2 guys and a lady. I talked to one of them during the flight, they came from different airlines. The guys were from Jetstar and Air Asia while the lady was an ex-SilkAir stewardess. More about them on the later part of my trip report. The announcements were made only in English and Finnish and there were quite a number of Chinese and a few Malay travellers on board, shouldn't there be languages in Malay and Mandarin as well? Later on, during a bad turbulence, a Chinese man was standing just outside the toilet waiting for his turn, one of the Finnish crew kept telling him to sit down. Since he didn't react, I felt that the crew should have gotten a Chinese crew to announce in Mandarin and not talking aggressively on the microphone. It may be a language issue for that guy. Just a normal earpiece, nothing to shout about. Had to use the blanket at a later stage of the flight, the aircon was real cold! On take-off, if was one of my most underpowered take-offs I had for a long time! It took ages to lift off and when it did, it didn't feel like it wanted to climb. It was so slow and even my neighbour was asking, was the plane climbing? It might be a bad thing actually, we had a good view of the city and not long after, we left Singapore and continued to struggle towards our assigned flight level. On my previous A340 flight with this airline, I flew from Tokyo Narita to Helsinki! Japan Airlines' Boeing 787 was also flying on this route, in fact about 10 minutes after our flight. Guess what? We took off first, but they landed first and were already at the gate! 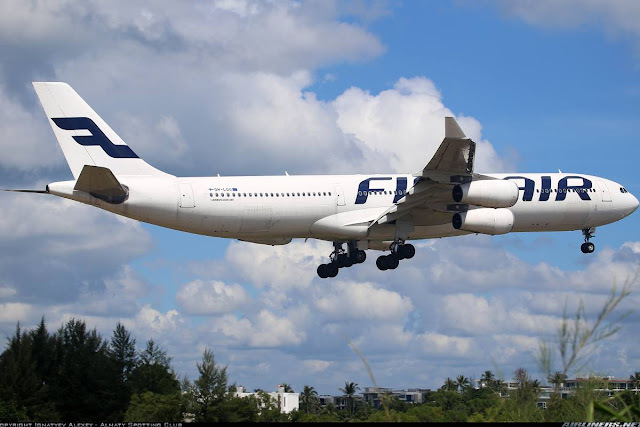 Good news for frequent Finnair travellers (at this point) is the airline will be taking delivery of new Airbus A350s (in Summer 2015) that will replace the A330/A340s. The A340, LQA, LQF and LQG will be retired, return to the lessor - ILFC. Once the seat belt sign was off, the crew started action immediately. They were to serve the dinner (full meal at this hour didn't make sense for me) quickly as most of the passengers would choose to sleep. So keeping myself awake, I played around with the IFE system. Like I mentioned earlier, there were only 7 channels, but the movies were of the latest and there were some that I had not watched before, unfortunately they were not working so I had to settle for the working ones. Soon, the smell of the food filled the cabin and I was feeling a bit hungry and a few others as well. As usual, the special meals were served first and the crew served from the front to the back and even at breakfast time too! So the rest of the passengers at the back had to wait. While, the trolleys were moving closer to me, I noticed the hot food trays were on the top of it and a kid almost hit his head on it and luckily his parent was alert! I felt that the crew shouldn't expose them to avoid accidents. A male Finnish crew was a few rows in front and I overheard his conversation that the only choice of meal was the beef (chicken was the other option), I wasn't surprised at all. When he came to my row, he didn't say anything, he just passed the food to us without apologizing that the chicken meal was not available. Thumbs down for that! During the meal service, the crew had to go back to the seat with the trolleys (I can understand their frustration) due to the turbulence, they should keep a look out for elbows or legs sticking out. Something they could learn from the Korean and Japanese crew, is by telling passengers to be careful as the tolley is going pass them or something like that. Here is my meal - beef noodles. This has to be one of my worst meals I had for long haul flights! Beef was salty and the noodles was "yuck",and I didn't finish it. The salad and the banana cake were not too bad but the best part of this meal was the bread. You can't go wrong with that! That sums up the quality of this meal, not the airline's fault. I blame this more on the food caterer in Singapore. You have to pay for the snacks! Luckily for me, I managed to sleep for about 4 hours, then I watched some movies (have to repeat a couple of them) before I decided to stretch some legs went to the rear, grab some snacks and talked to one of the crew. Snack bar located at the rear of the aircraft. The ex-Silkair crew whom I also met on the return flight was a crew with an attitude problem. She wasn't friendly towards me and a few others. Looking at us like we were dirt and I spotted her talking very sweetly to a Caucasian. I think some of you will know what kind of girl she is. That shouldn't be the way! While the other 2 staff were better. They were at least sociable and more helpful. I came back to the back cabin later on to ask for something, only the male crew responded while the female gave me a glance and continued to do her make up. How unprofessional she was! I should have taken down her name, she reminded me of the crew on board my Singapore Airlines's flight a few months ago. Anyway, I had some good chat with some passengers at the rear then before I knew it, it was time for breakfast. The flight was turbulent mostly over the Bay of Bengal and on approach to Helsinki, other than that it was smooth. This photo was taken while flying over Russia, not too long more to go before arrival. Soon, it was breakfast time. I hope at that time, the meal was to be served from the rear to the front and also a better quality meal to make up for the disappointing dinner. However, I was once again disappointed, meal started from the front and it took quite a while before it reached to my row. My seat partner chose a special meal and hers seemed not bad but she didn't like it. Was it any better? Nope, I had a hard time digesting all down. I had to because I didn't think I had time to have breakfast when I reached the hotel later. Because once I reached the hotel, my intention was to put my stuff in the room, wash up then off to meet the rest of the Qualityhunter group. For the rest of the flight, it was uneventful. We had a slightly bumpy approach, seat belt signs were turned on quite early, I presumed it was probably due to weather but it turned out to be smooth even through it was raining. The crew came about to do some routine checks and soon we touched down runway 04R in wet condition. Taxied to our gate 32 and that's the end of my flight. Was I glad to get off the aircraft at that point? Yes, I was! Both hardware and software products were disappointing. I can understand about the hardware part since it was due for retirement a year later, but still anyone who booked on the airline to fly to Europe would find themselves extremely unlucky to have gotten LQA, LQF and LQG. Personally, I feel that the airline should deployed this on shorter high demand routes instead. Its a pity the A330-300 is just short of range to fly to Singapore with full load. It flew to Singapore before a few times possibly with lighter load and that makes a lot of difference. One more thing I forgot to add in, the airline allows you to use your electronic devices from gate to gate. This means that you can use them even on take off and landing, no need to switch them off, but for your phones you have to leave them on flight mode. First airline for me that allows this! I am thankful that I got to experience both J and Y class on the wide-bodies. A big thank you to Finnair for making my trip possible! However, I was disappointed with my flight experience. I hope the management will take notice of this. The importance of service towards each passenger will determine whether they will fly with the airline again as they will possibly spread the whatever feedbacks they have on social media and family/friends. Comments from mine and from some other trip reporters has added in some weight to traveller's decision whether to fly with the airline. I have received emails and messages about my flight experiences and asked for my recommendation. Personally I feel that equality is very important, regardless of where one comes from, they should all be treated equally with respect. Seeing some of the staff treating other races better than others is sad. Racism is part and parcel of life, but its time to do something about it. If your airline can't compete with others in term of hardware, then make it up by focusing on having one of the best in-flight services on all classes. Some of the major airlines' in-flight service had dropped since the 1990s but passengers still fly them because they have the hardware and network. Looking at the positive side of this trip, I reached there in time and got to experience the wonderful Helsinki Airport, had a warm welcome by the immigration officer and an easy guide to the hotel. Do check out my return flight trip report. Interesting review. I went on Finnair's A350 this year between HEL and HKG, as well as HEL-LHR and it was really wonderful. The PTV was very fluid and responsive and the flight map looked really nice, and if you zoom in to a few selected cities there is also a detailed street map that is provided by "Open Street Map". It wasn't as good as Google Maps but still the street maps were a nice touch. The food was pretty good overall, though on AY70 HKG-HEL the food wasn't so good. On AY831 to LHR the food wasn't free, like their intra-Europe flights, but the caesar wrap that I ordered really tasty (coffee and water were free). So yeah, I highly encourage you to fly on Finnair's A350 and since all the A340 have been retired, no more praying that you would get the newer A340 instead of the used A340. The A330, which still exists, have the exact same interior as the newer A340.